The 'Robinson Casket' is one of a group of at least nine solid ivory caskets made in Kotte, Ceylon (now Sri Lanka), and sent by the kingdom's rulers to Portugal as diplomatic gifts, in some cases to mark specific historical or religious events. It is believed to have been made about 1557 to commemorate the King of Kotte's conversion to Christianity and the birth of a grandson and heir to the King of Portugal, hence the choice of Christian motifs and symbols of birth and rebirth that are intricately carved throughout the casket. The piece is among the earliest examples of Ceylonese art made for western consumption, and it illustrates beautifully how local craftsmen interpreted European forms and motifs and married them to their own decorative traditions. The casket is named after Sir John Charles Robinson, Superintendent of Art Collections for the South Kensington Museum (renamed the V&A in 1899), who acquired it in Lisbon before 1888. 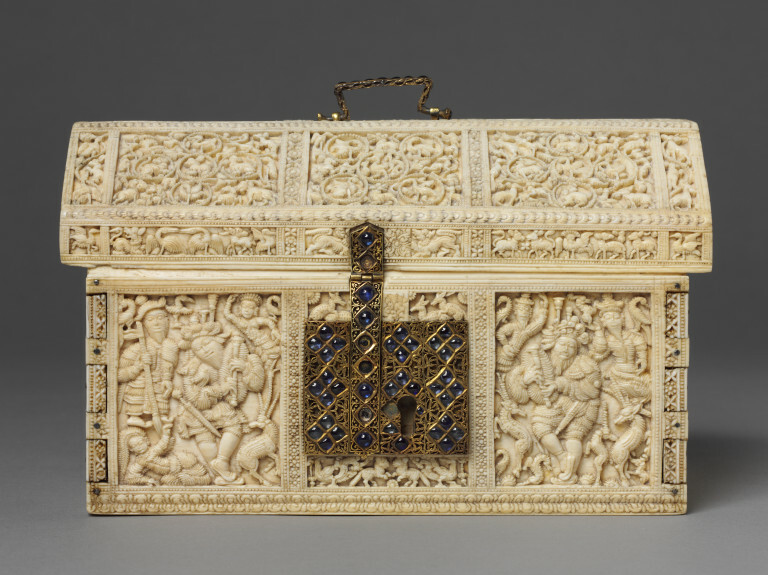 This casket is constructed of solid carved ivory panels, with silver hinges, the lock is set with sapphires, and the handle is of gold filigree. The subjects are biblical: the Betrothal of the Virgin, the Nativity and the Tree of Jesse. On the left panel of the back is the Betrothal of the Virgin, with Mary and Joseph standing on dragons. The right panel of the back shows the Rest on the Flight into Egypt. The Tree of Jesse, is depicted on the right end of the casket. Portuguese support in his attempts to subordinate his neighbouring rivals, particularly his brother and nominal heir, Mayadunne Pandar, ruler of Sitavaka, and establish his grandson Dharmapala as his heir. The Portuguese endorsed Bhuvaneka Bahu's claims, and in 1542-43 an embassy was sent from Kotte to Lisbon, and Dharmapala was crowned in effigy by Dom João III (reigned 1521-57). Through this gesture Bhuvaneka Bahu managed to secure the succession to his throne and bolstered his position as overlord of the island. This casket is the first in the group to depict Christian motifs. Bhuvaneka Bahu, keen to secure military support from the Portuguese, bargained with continuous promises to convert to Christianity. This he failed to do, chiefly since he felt it would lose him the support of his people, who were largely Buddhist. The situation had changed by the time of his grandson Dharmapala's accession in 1551, princes from Kandy and Sitavaka having already embraced Christianity. Dharmapala was himself invested on the throne by the Portuguese, and, after six years as king, he and his court adopted Christianity. In 1557 Dharmapala dispatched a letter to Dom João III informing him of the conversion; it is very likely that the casket was sent to Portugal via Franciscan monks accompanying this announcement. In the same year the Portuguese succession was secured with the long-awaited birth of Sebastiao - known as 'O Desejado' or the desired one - grandson and heir to Dom João III. Hitherto it had been feared that Portugal would be absorbed into the Spanish empire, the strongest claimant to the throne being Philip II of Spain. In Sebastiao the gradually declining Portuguese empire saw its opportunity for revitalisation, and the decoration of the casket refers to this event in its expression of joy at the conversion of Dharmapala. This interpretation is certainly supported by its iconography, which develops the themes of birth and rebirth with both Christian and Sinhalese motifs. source down to subtle elements such as the positioning of figures and gestures. Printed religious images were employed in Portuguese spheres of influence from Africa to East Asia, originally as tools for conversion but ultimately inspiring the decoration of a range of locally-made secular and religious objects. A print by Albrecht Dürer (1471-1528) of 1514 was clearly the source for the modelling of the central bagpiping shepherd on the front right and left panels of the casket, although liberties have been taken with aspects of his dress." Amin Jaffer, Luxury Goods From India: the art of the Indian Cabinet-Maker, London : V&A, 2002, pp.14-16, ill. ISBN: 1 85177 381 9. This lidded box, the work of the finest Sinhalese ivory carvers, follows the form of a European casket and is decorated with a mixture of secular and Biblical scenes, presumably modelled after European engravings or other forms of European art made accessible to them through the activities of Portuguese diplomats and priests. This box is believed to have been commissioned by King Dharmapala, ruler of Kotte, to accompany the announcement to the Portuguese court of his conversion to Christianity. It was collected in Portugal earlier this century. 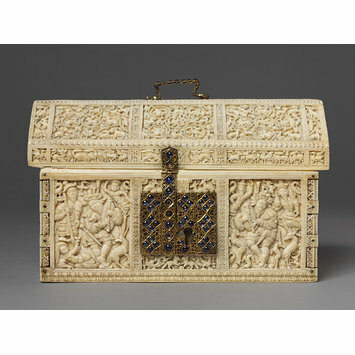 Ivory casket, 'Robinson Casket', carved with Biblical scenes, with silver hinges, gold filigree and sapphire ornamentation, Kotte, Sri Lanka, ca. 1557. Guy, J., and Swallow, D., (eds). ‘Arts of India: 1550-1900’. London : Victoria and Albert Museum, 1990. ISBN 1851770224.p48, no.32.